If you are a manager today, you have a plethora of management tools at your disposal. A book published by Pearson in 2013 catalogues the ‘80+ key tools for every manager to build a winning strategy’, ranging from SWOT and Porter’s ‘five forces’ to scenarios, portfolio matrices and strategy maps, to name but a few. Given the abundance of methods available, are you satisfied that the tools you use really address your management and business challenges, can they be adapted to your particular context and can they be combined together into a seamless management toolkit? If not, why not? First and foremost, you need the right tools for the job. And with so many to choose from that’s not always as easy as it sounds. Then when you start to use tools in ‘real life’, getting acceptance from colleagues and ensuring the tools are properly configured and embedded within the wider corporate system is often a challenge. To compound your difficulties, new tools and variations of existing tools are constantly being introduced, leading to further confusion over which one does what, along with, on occasion, unhelpful overstatements of their capabilities. And using tools effectively, even – or perhaps especially – the ones we are most familiar with, is not straightforward. Consider the ubiquitous SWOT analysis. It is very often used in a highly simplified form which produces a neat, bullet-pointed list of strengths, weaknesses, opportunities and threats. But these are of little value without a structured analysis of the organisation’s ability either to exploit a strength or address a weakness, some relative measures of the value or risk they may have for the business, and a way of understanding the different factors and their implications. The SWOT analysis tool that most people use simply does not incorporate any of these critical dimensions. But the news is not all bad. There are some very useful tools out there, if they are chosen well and adapted to meet the particular needs of your organisation. There are some key things we believe tools must be able to do: define, quantify, compare and contrast, and map – causally, spatially and conceptually. And whichever of those functions you might want a particular tool to perform, they must be clear to everyone as the tool is being used. For instance, you might want to do something around visioning or futures development. Which sounds reasonably straightforward. But is the task to define a vision? Or both to define and quantify a vision? Or compare possible visions or scenarios? Or map possible visions or futures? Actually, when you come to think about it, what are the underlying components that constitute a meaningful vision? In other words, you need to define very precisely what you want to achieve and make that explicit – otherwise you are likely to end up in a place you didn’t necessarily want to be. One of the areas we are looking at is how to use structured templates that guide users through the process of applying a tool. For example, to make better use of the PESTLE (Political, Economic, Socio-cultural, Technological, Legal and Environmental) tool, we have designed a template which helps users think about and describe the important factors in terms of: types of trends and drivers, the timeframe, the likelihood and potential impact of each factor, their relevance and the implications for the organisation. First, all tools should be ‘human-centric’ by which we mean they should be designed so that everyone involved participates fully. Without this you cannot have proper strategic dialogue and co-created solutions which everyone buys into. Second, they should be activity-based using workshops and small-group activities with structured tasks for addressing and solving strategic problems. Third, if the activities are to be facilitated then the facilitators must be neutral – they should focus on the process and make no direct contributions to content. Fourth, the tools should be as ‘lightweight’ as possible so that all workshops, templates and activities can accommodate a degree of flexibility and not be overly prescriptive. Toolkits should always be built in a modular fashion so that the constituent tools can be readily integrated with one another. They should also be scalable so they can be used at different hierarchical system levels both inside and outside (if appropriate) the organisation in order to provide a wide dynamic range. Last but not least, to be effective the tools must be visual – both when they are being used, for example as workshop charts and templates, and when comunicating the outputs whether as full reports or summaries. The news is not all bad. There are some very useful tools out there, if they are chosen well and adapted to meet the particular needs of your organisation. CTM is particularly interested in how individual tools can be integrated into robust toolkits that are designed for use within specific organisational contexts. If tools are used in isolation – which they often are – with little, if any, consideration of how they relate either to one another or to the existing business architecture, the chances are their effectiveness will be compromised. 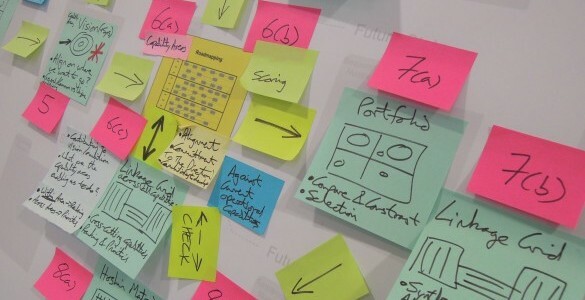 Roadmaps should be primarily used to align and plan. They enable different groups or disciplines to achieve consensus on how best to move forward and realise a vision. The second type of tool in the platform are portfolio matrices, typically in the form of 2x2 matrices which are very common in most organisations. Such tools should be used to prioritise and balance and hence provide focus, whether on specific layers or areas of a roadmap or on the analysis resulting from an interlinked grid. Interlinked grids are the third type of tool in the platform. This tool type is very broad, ranging from basic tabular tools through to highly structured grids, such as those used in Quality Function Deployment. Whatever their level of sophistication, the role of inter-linked grids is to plot and weight. Plotting is used to uncover relationships, unravel complex interconnections, emphasise interdependencies and highlight gaps or overlaps. Weighting can then be applied to provide contrast and significance to the plots. With just this set of three tools at two different levels, there are 57 possible sets of tool combinations and an associated 1,950 possible sequence permutations – which clearly provides plenty of scope and options for practical toolkit arrangements, with the potential to include additional tools where required. 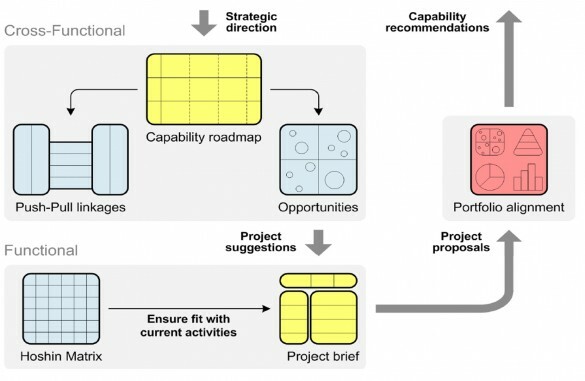 To help organisations construct management toolkits, we have developed a visual prototyping method for toolkit creation that maps the contribution from each tool in the toolkit in terms of roles, functions, decisions and deliverables. The approach instils a rigorous emphasis on the combined utility of the tools and embraces the need to be ‘fit for purpose’ given the organisational environment. Creating a toolkit is, arguably, the easy bit. Using them in practice is often where the real challenge lies. If it is to have any chance of succeeding, the toolkit must be embedded into the current organisational systems and processes and aligned with the business cycle. Training and guidance needs to be in place, as do processes for monitoring outputs and putting them into practice, for making ongoing refinements based on user feedback, managing resource constraints and corporate expectations. The CTM mantra is ‘start small and iterate fast’, so you can fine tune quickly and easily. model canvas. The training also gives you the opportunity to explore which tools would work best in your organisation, incorporating other tools you are already using or those with which you are already familiar, as required. Tools and toolkits are a growing area of work for CTM, so enquiries are always welcome.